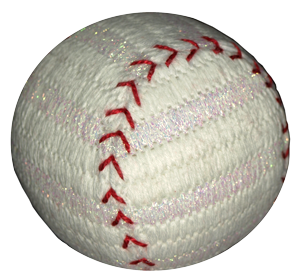 Description: Stitch this needlepoint baseball for your favorite sports fan! You can personalize your baseball with a stitched monogram! Can be finished over a real baseball or styrofoam form. Includes line drawn canvas, with stitch suggestions and finishing instructions. Uses 14 count interlock canvas 13" x 14". Includes line drawn canvas, white threads used for model, stitch suggestions and finishing instructions.